This music house is the complete package for entertainment, ambiance and drinks. At Fifth & Thomas, music is a sensory experience that satisfies the musical appetite. It serves up the best music in the area, delivered in a homey atmosphere of honky-tonk chic. Its indoor and outdoor spaces provide kicked-back, beautiful settings for events ranging from family gatherings to corporate retreats and private chef tables. “My personal goal was to bring an energetic venue where everyone is happy,” says Shannon Moore, a partner at GMT Pubs. “We want our team to be happy, our guests to be ecstatic and our artists to have a venue where they love to play. We have accomplished that by putting together a group with over 50 years of combined industry experience that knows how to create success.”Rely upon Fifth & Thomas to blend live music and lively cuisine in delicious and memorable ways. A welcoming atmosphere invites you to become one with the music and indulge in a signature cocktail. Seasonally inspired menu items are available — please visit our website for more information. Fifth & Thomas hosts a revolving roster of musicians whose genres range from jazz to rock and country and more. National acts that have appeared on the main stage include: American Aquarium, Lucero, Cracker and John Moreland. 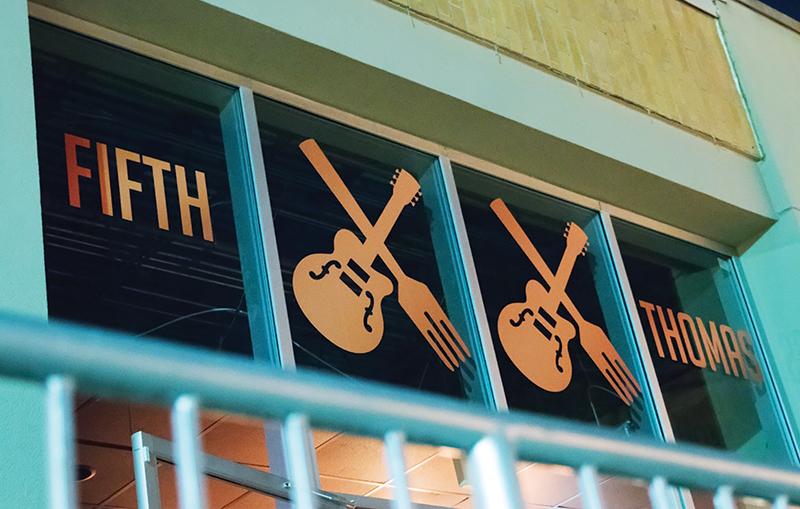 As a music house, Fifth & Thomas is the complete package for all who seek the best in entertainment, ambiance and drinks. Fifth & Thomas invites you to discover and enjoy all that it has to offer. Indulge!